Don Smith (California, United States) on 4 September 2008 in Landscape & Rural. This is an image I had been thinking about creating for quite some time and had previsualized in my mind. On the surface it looks like a straight image (which for the most part would be correct) but there were small details that needed attention before I could rest assured it was a finished photograph. To create this image, I needed a calm and moonless night. 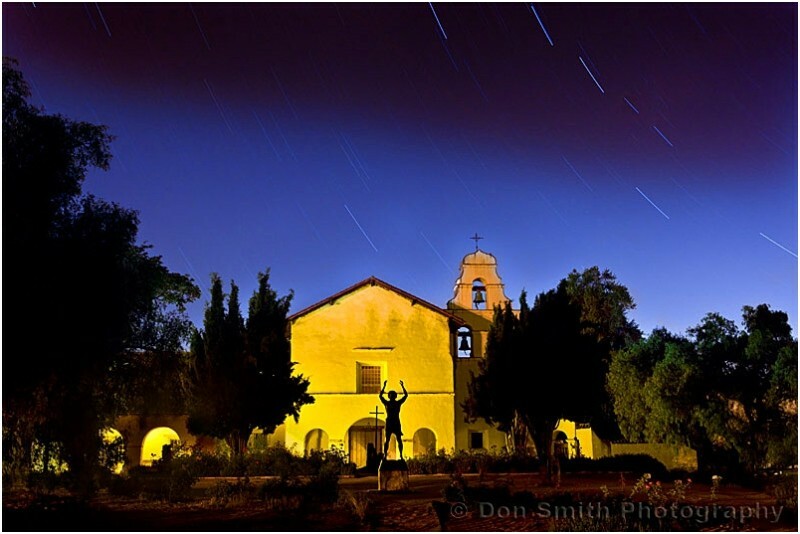 This Mission is located, fittingly, in the California town of San Juan Bautista (Spanish for John the Baptist whose statue appears in the foreground). My friends James Guillory and Mike Hall joined me for the shoot and we secured a position which shielded us from any curious visitors. My first thought when working at night is: "will there be any hot spots to deal with?" As it turned out, the only real trouble spot was the arch on the left side of the frame. For some reason, there was a brighter light illuminating this arch than any of the other lights present. I started at sunset by finding the appropriate composition, then I taped off my focus and zoom as I knew I would be blending various exposures. The arch exposure was shot within minutes of sunset and the exposure was set for the arch itself. I later blended this exposure during post production. Posted time for sunset was 7:42pm but we had to wait until after 9:00pm for the sky to darken enough where we could see stars. There is a period after sunset called "civil twilight" - commonly called dusk. We made sure we were well beyond this point. Collectively, our other concerns were airplanes (the sky was part ot the flight path for San Jose International Airport) and ambient bleed from nearby Earthbound Farms (remember the spinach e-coli scare). James had been shooting a lot of night scenes and recommended a 20-minute exposure at f/8. We needed that amount of time to get the streaks in the stars. I double-processed this image in Adobe Camera Raw - once for the sky which I cooled down and once for the Mission which I basically left alone as the camera recorded it. With the use of layers and masks, I blended the two images in Photoshop CS3. My final two chores were to clone out a jet streak (done primarily with the spot healing brush and clone tools) and eliminate some reddish-flare created by the Earhtbound lights above the righthand trees (I used the patch tool for this job). The roses in the righthand side foreground were illuminated by a car's headlights (a nice serendipitous moment). As an aside, for you film buffs out there, you may recognize this Mission and especially the bell tower, as the classic Alfred Hitchcock movie Vertigo used this setting for its final scenes. Your processing is well over my head but the effect is stunning. well done Don. Thanks Maxine. Blending is really easier than it sounds. There are many tutoriols on the web and some excellent books, especially be Scott Kelby and Rob Sheppard. It goes back to my B&W days where you look at your first print and then try to detemine how to make it better. Digital is your first print. Hot spots can make an image appear unbalanced becasue they eye will gravitate to the hot spot - it's a distraction. Impressive effort, Don-and beautiful results! Thanks. It's always a good feeling when one can visualize an image in one's mind and then have all the elements come togeher to achieve the desired result There sre so many variables with landscape photography that are out of the photographer's control - as you well know. I would have liked less ambient bleed along the top of the Mission and trees for example but not much I could do about that. Thanks for writing; I hope all is well with you and your family. just wonderful light and color -- of course the star trails add just the hint of dynamic magic. gorgeous!